Michelle O’Neill said the Good Friday Agreement ‘needs to be protected not imperiled’. TOMORROW we mark the 20th anniversary of the Good Friday Agreement. Despite our ongoing political challenges, Ireland has been transformed over the past two decades as a result of the Irish peace process. We have emerged from decades of political conflict towards a more prosperous, peaceful and democratic society and the Good Friday Agreement is the foundation stone. The agreement defined the new relationships within and between Ireland and Britain. It is time now to get on with building the process of reconciliation and a better future for everyone in our society. I want to build bridges and heal the wounds of the past. To do that, just as in 1998, Sinn Féin needs Unionist partners. We believe political leaders have a special responsibility to bridge the divide between us. Irish nationalism and unionism must reach a sustainable compromise through respectful dialogue and political agreement that will move us beyond the impasse of the present and into a brighter future. We are committed to the Good Friday Agreement and its political institutions, but they must enjoy the confidence and support of the people they were established to serve. The agreement is a treaty between the two governments lodged with the United Nations as a binding agreement under international law. We are therefore calling on both governments to take decisive action and determine how the obstacles to power-sharing will be explicitly removed under their joint stewardship. The DUP’s collapse of the talks is not a justifiable excuse for refusing to afford citizens civil, social and cultural rights in the short term. 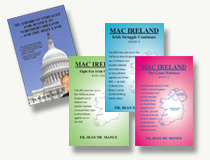 The British and Irish governments must set up the British-Irish Intergovernmental Conference. The agreement must be defended and the political and human rights safeguards it provides for all citizens must be protected. The Brexit debacle has proved the value of these. Had it not been for the Good Friday Agreement and the strong stance that Sinn Féin and the EU 27 have taken in defense of it, today we would undoubtedly be facing the imposition of a new frontier on our island. The full implementation of the agreement will also see the end of the DUP’s blockade on rights because such discrimination is clearly incompatible with the agreement and its principles of equality and respect for differing aspirations and beliefs. The Agreement is also the route map to the peaceful reunification of our country. It commits a British government to hold a referendum on unity and to legislate for a united Ireland should a majority vote for that outcome. Sinn Féin believes a new Ireland – a fair Ireland, an Ireland of equals – is in the best interests of all citizens. It will have a place for all citizens, regardless of creed or political allegiance, what language you speak or who you love. best future for themselves and their families in that new Ireland. Therefore, there should be a referendum on Irish unity within the next five years and we are calling on progressives and Democrats to demand that the British and Irish governments agree on a date for such a referendum. And running through all of this, the progress of our past and the potential of our future is a single common denominator – the Good Friday Agreement. It is the agreement that ended the armed conflict. It is the agreement that opened up new horizons for a peaceful, reconciled future. It needs to be protected not imperiled and I would appeal to all progressive voices to raise them in defense of the agreement. It belongs to us all – then, now and in the future.